This week’s Highlands NC real estate spotlight is on the Old Edwards Club at Highlands Cove. This mountain community was developed to offer a fabulous lifestyle to its residents, incorporating a golf course, tennis courts and full-service clubhouse in a stunning mountain setting. This gated community offers an exceptional location for a Highlands vacation home. Living in the Old Edwards Club at Highlands Cove offers access to the amenities of the Old Edwards Inn and Spa, which means a world class spa is at your fingertips. This 440 acre master-planned community can keep you as active and social as you want to be, with fantastic access to the area’s hiking trails in addition to the golf, fitness, tennis and swimming pool facilities. Ownership opportunities at the Old Edwards Club at Highlands Cove include well-appointed condominiums, stunning single family homes or lots on which to build your custom crafted dream home. 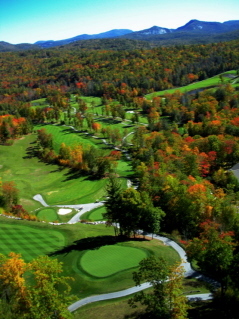 Even better you can choose whether you want views of the golf course or panoramic views of the Blue Ridge Mountains. Of course you may choose to be nestled in the woods instead. Regardless of your choice, living here ensures an opportunity to be active and social in an impeccable setting. Contact me, Lynn Kimball, today for more information on Highlands real estate and the Old Edwards Club at Highlands Cove. Let me get you started on your home search and ensure you locate the ideal property for your lifestyle.